Forum » SpaceEngine » Science and Astronomy Discussions » What exactly are "Oceania" planets? What exactly are "Oceania" planets? First of all, I am sorry if this has been discussed before. what EXACTLY are "Oceania"-type planets supposed to represent? a) outer planets/planetoids made chiefly of ices which, though one way or another, end up closer to the star and form oceans. This would be basically huge bottomless (unless you call fuzzy transition into pressurised ice a "bottom") balls of water. As a rule, they'd be many times more massive than Earth and would have dense atmospheres. b) classic terran planets like Earth or Mars which, through an accident of their early evolution, ended up with a lot more water so that most of their surface is covered by it. For instance, if you raised the sea levels on Earth by, say, ~5 km, most of the surface would be ocean, with only certain mountain peaks and plateaus remaining dry. These would be far more recognisable and habitable to humans. Since in Space Engine, Oceanias have these weird, icy (or is this just a lack of a texture??) islands on them, I guess they are modelled more on case A), even though in "reality" some of the Oceanias should look more like B). The islands are a bug, they're supposed to be ocean all the way through. And are you really sure this called for a new thread? 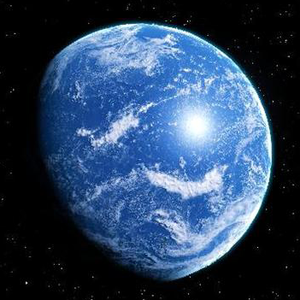 As to the possible types of Oceania, some may simply be terrestrials like Earth but with more Ocean (your type a), and others may be completely water worlds, with transitions to high-pressure ices at lower levels (type b). From above these may superficially look the same, but some properties like bulk density will be different. I don't know if SE yet distinguishes the different types, but it is supposed to render them as a terrestrial sized body with a deep ocean. Some may also have ice caps or a frozen surface like Europa, depending on distance, rotation, and greenhouse effect.